When Rafe was in Boston a few weekends ago we were foraging in my nearly empty fridge for the makings of a tasty breakfast. I only had 2 eggs - not nearly enough for a Sunday scramble....no cereal. No bread for toast, and only half of a trader joe's baguette. I rarely indulge in sweet breakfasts, but putting on my refrigerator MacGyver hat I decided my option was simple. Use the french bread to make FRENCH TOAST. Rafe was skeptical....only having eaten french toast made with Challah or Texas Toast... 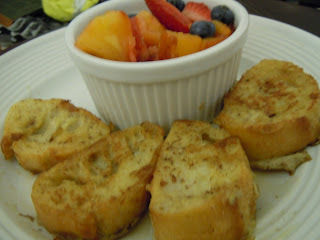 But, I argued, if it's FRENCH toast you have to imagine that when they started making it, they likely only had FRENCH bread. I cracked my two eggs into a bowl, added milk, vanilla, cinnamon and a little sugar. I sliced the french bread into little medallions and dropped them in for a quick soak while my butter melted and got all frothy. A few minutes on the griddle and we had breakfast, combined with the refreshing fruit salad that Rafe brought for me - he knows how to show a food blogger a good time. 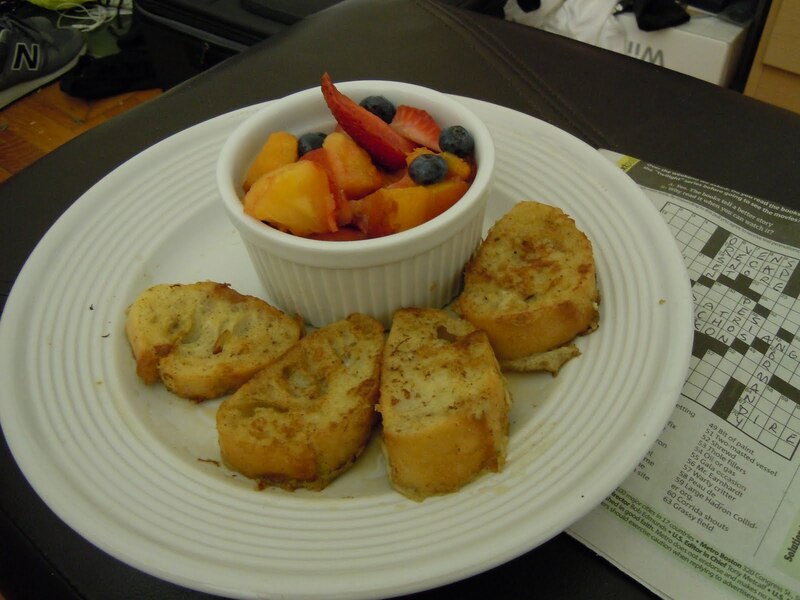 That french toast gave us the strength to attempt the Sunday crossword. Rafe got over his skepticism and had to admit that it was pretty darn good. Even though the bread was only a day or so old, the chewy baguette made a great french toast - it soaked up enough of the batter to be custardy in the middle, but retained its shape and a little chew in the crusts. The weekend is fast approaching, give this french toast a try on Saturday morning! Mmmm looks VERY good! I love French toast, but we rarely make sweet breakfasts. Maybe I will make this Sunday. I am like you and not a big fan of sweet stuff for breakfast but this looks like a quick fix for an empty fridge! Yum! I'm with you (and Fun and Fearless!) about not really caring for sweet stuff in the AM but every once in a while the craving strikes. These look like a good fix for that! Truth be told, I prefer a savory breakfast too - but sometimes that craving hits and can only be satisfied with some maple syrup!